Today, dear readers, we’re cluing you in to a must-read book about vaccines, communication, and controversy: The Panic Virus by Seth Mnookin. This non-fiction page-turner delves into the longstanding myth that vaccines cause autism — and the now-discredited study that created it. Even though the study was full of problems and bias, its claims were widely reported in the media — and citizen action groups rallied behind it in a well-intentioned attempt to understand the causes of autism. In the years that followed, countless other studies showed no link between vaccines and autism — but rebuilding the public’s trust can take a long time. At its core, Mnookin’s book asks a larger question: when we’re looking for health information, who do we trust to give us the truth? In the age of Google, WebMD, and live-streaming news, parents making vaccination decisions have more sources of information than ever before — and not all of them are trustworthy. Since many people may still question their safety, it’s clear that communicating about vaccines is really important. It’s also somewhat loaded. 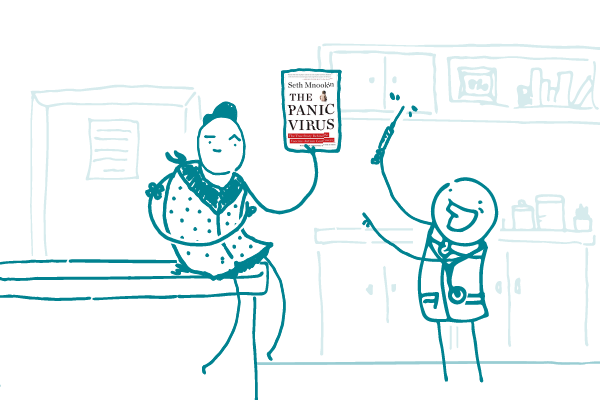 The Panic Virus offers helpful context and poses thought-provoking questions that can push health communicators to do our very best with this critical topic. We ❤︎ it — and we bet you will, too. The bottom line: It matters how we communicate about vaccines. Learn more in The Panic Virus.